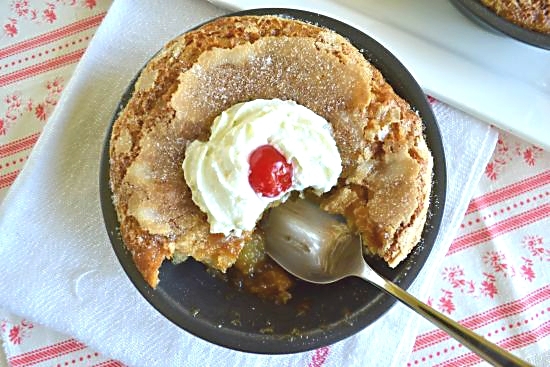 These Del Monte Mini Peach Cobbler Pie recipe are made with Del Monte Fruit Cups. 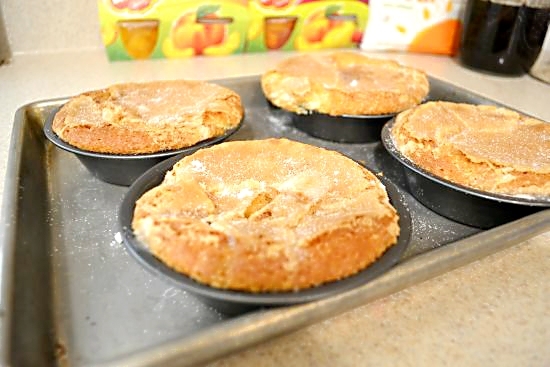 Del Monte fruit cups make a perfect filling for these mini peach cobbler pies. School has been back in session here for almost three weeks. We are trying to get use to the new schedule. Getting up before 6 am is not something I like to do! We’ve been a big fan of Del Monte fruit cups for many years. We usually have a pack or two in the cabinet. All the kids eat them. Even the big kids like them. Del Monte Fruit Cups are the perfect #SmartSnack for after school or any time. 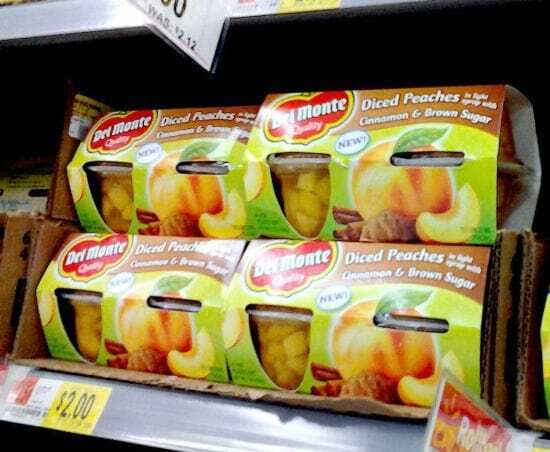 While I was shopping at Walmart the other night I spotted a new flavor of Del Monte fruit cups. Or at least one I had never noticed before. The new flavor of diced peaches in cinnamon and brown sugar syrup gave me an idea for this recipe. A nice little treat for the kids when they come home from school. This would also be a great after school snack on a chilly afternoon in the winter. unbleached flour, sugar, brown sugar, baking soda, baking powder, salt, butter, milk, an egg and vanilla. You see that quart bottle. That’s what I have left of my homemade vanilla. I am going to have to make some more soon! You can find the complete list of ingredients and direction below. Sift the dry ingredients into a large bowl. Mix the wet ingredients in a small bowl. 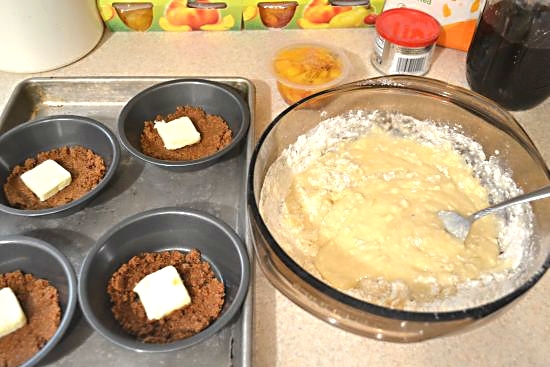 Add the brown sugar and a pat of butter to each mini pie plate. Add the egg mixure into the dry ingredients and stir until just mixed. Open the two cups of Del Monte Peaches in Cinnamon and Brown Sugar fruit cups. Drain reserving the syrup. 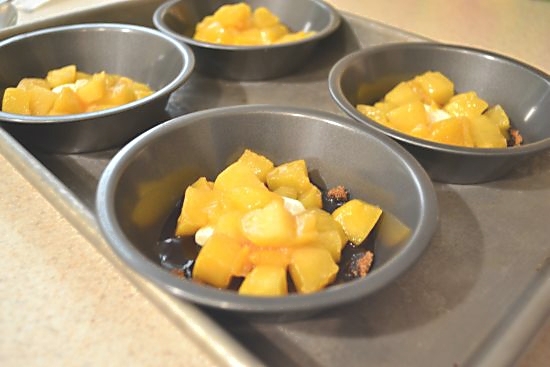 Divide the diced peaches between the four mini pie pans or four ramekins. Cover the peaches with about 1/2 cup of batter. Sprinkle the tops with sugar and bake. The sugar is what gives the cobbler a crunchy pie like top. Bake for about 20 minutes until cooked through and golden brown. This recipe turned out so good. The cobbler batter stays soft and moist. The peaches have just the right amount of cinnamon flavor. The kids loved it. It’s perfect for a special after school snack. Sift first 5 ingredients into a large bowl.Set aside. Beat egg in a small bowl and add milk and vanilla. Mix well. 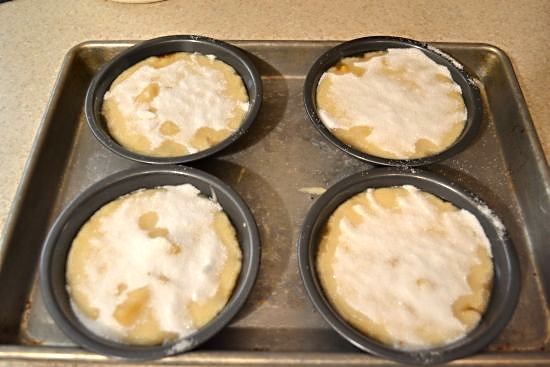 Sprinkle about 1 tablespoon of brown sugar into each of 4 mini pie pans or ramikins. Add pat of butter to the center of the brown sugar. Pour egg mixture into the large bowl with the sifted dry ingredients. Mix until just combined. Set aside. Open the two bowls of Del Monte peaches with cinnamon and brown sugar fruit cup snacks and drain the syrup into a small bowl reserving at least 4 teaspoons. 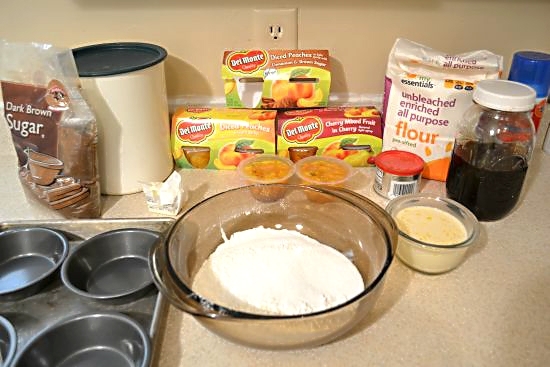 Divide the peaches between the four mini pie pans or ramikins evenly distributing them over the brown sugar and butter. Drizzle about 1 teaspoon of the reserved syrup over the peaches. 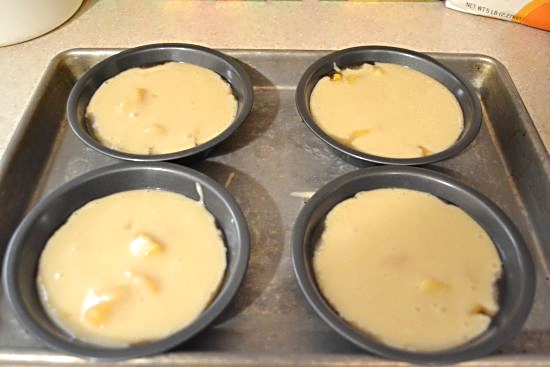 Evenly pour about 1/2 cup batter over the peaches covering them to the edges of the pan. I used a 1/2 cup measuring cup. Sprinkle about 1 tablespoon of white granualted sugar over the top of the batter. This is what gives you the hard pie crust like top. Bake at 350 degrees for about 20 minutes until the batter is cook through and the top is golden brown. You can check out all the available fruit cup flavors and find more recipes on the Del Monte Fruit Cup website. I am a member of the Collective Bias™ Social Fabric® Community. This content has been compensated as part of a social shopper insights study for Collective Bias™ andDel Monte #CBias #SocialFabric. Yum, yum, yummy! Those look soooo good! Oh my…does that ever look delicious! I’ve never had a sugar top on a pie but now I really want one!! 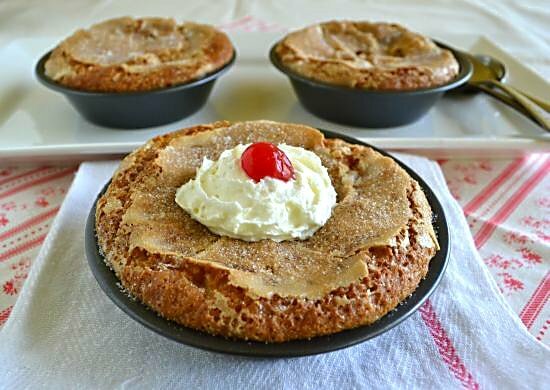 Your Del Monte Peach Cobbler Pies look fabulous! I love creative ideas like this that use grocery items in a unique way! That looks so yummy. I love the individual size!! I truly love your blog.. Pleasant colors and theme. This recipe is simple & easy to follow. The ingredients are basic enough that most households probably have them in the pantry. I am 71 & live alone. 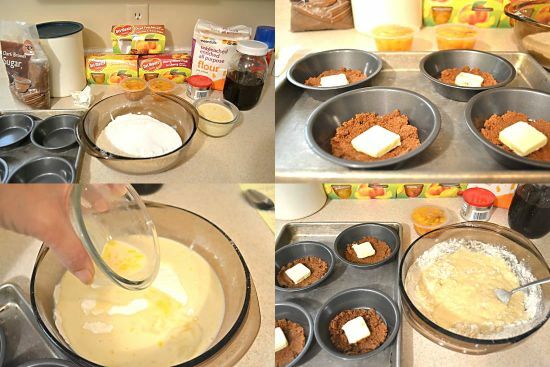 I follow the recipe, however, I divided the ingredients into my muffin pan in lieu of the mini pie pans. I lined the individual sections with foil muffin liners. I watched the progress of my mini peach dish very closely as all ovens are a little different. They turned out delicious! I love Tami g a basic recipe and making it My own. Also, I love cookie g in batches _ freezing individual portions. It doesn’t take any longer to cook a pot full than it does to cook enough for one meal. FYI: I PREFER to freeze in “Wide Mouth pint size Ball Jard. I can store several in the door of my freezer. Good luck & happy eati; especially to all my fellow seniors. Save money… Freeze your left-overs.